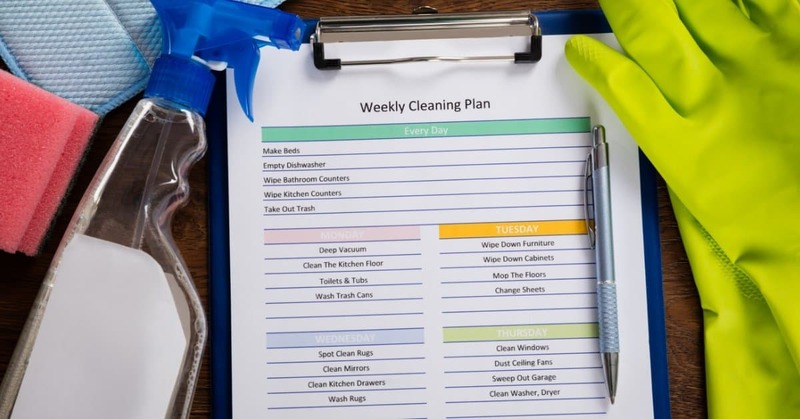 A weekly cleaning schedule, or any sort of cleaning schedule for that matter, may sound extremely unappealing to you, especially if you’re not someone who thrives on a schedule. I, on the other hand, love a good schedule. I feel like I would get nothing done if I didn’t have one – but I wasn’t always like this. Grab your printable weekly cleaning schedule here. Rewind a few years and I hated the thought of having to follow a schedule. I thought all a schedule did was hinder creativity and make you feel bound by something. It wasn’t until I reluctantly gave a schedule a try that I realized how helpful they really could be. I went from forgetting half of the tasks I was supposed to complete in a day, because I refused to use a schedule, to getting all my daily tasks done in half the time! I started off with daily to-do list type schedules, then I eventually created a cleaning schedule for myself and realized how much faster I could get all my cleaning tasks done while still doing a thorough job. Now, just because I thrive when I use a schedule doesn’t mean my whole day falls apart if something doesn’t go exactly according to the schedule. I like to keep some wiggle room and flexibility in my schedules so that if something doesn’t go as I originally planned I can keep trucking and pick up where I left off, or move some things around and still get everything that needs to get done that day done. 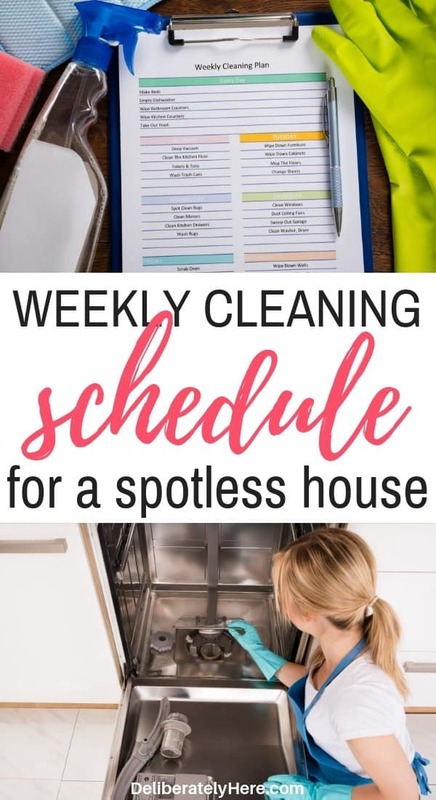 Whether you’re someone who loves schedules or you could really care less about them, I am a strong believer that having a weekly cleaning schedule can help even the busiest of people get all their tasks done in less time. Using a schedule helps you stay on track and keeps you accountable for what needs to be done throughout the day. Schedules will help you spend less time lollygagging and more time being productive. You’ll also have more family time when you use a schedule since you’ll be able to prioritize your daily tasks and complete the most important ones first. There are thousands of cleaning schedules that you can find online or download on to your phone, which all work great. But for me, having a physical schedule that I can write on and cross stuff off of helps keep me more accountable and productive. 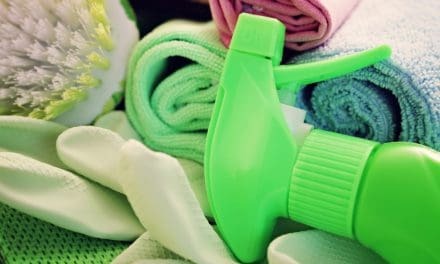 You can click here to download the weekly cleaning schedule onto your device and print it off, but I would strongly encourage you to also continue down this post and read the weekly cleaning schedule here as I have extra notes that are not included on the printable version of the cleaning checklist. Below you will be able to see how I have split all the cleaning tasks that should be done in a week up into bite-sized chunks that you can do each day, without having to spend all day cleaning. Just like a weekly cleaning schedule, having a daily cleaning schedule is also important as there are a few tasks that should be done more than once a week – once every day – that don’t take much time, but do need to be addressed. I have also included these tasks on the printable weekly cleaning schedule found here. First thing in the morning you and everyone in your family should be responsible for making their own beds. Of course, if you have young children you will likely have to give them a hand, but don’t do it all on your own. Encourage your kids to make their beds while you offer a bit of assistance if needed. Though this is a small task and may seem insignificant, it helps teach your children responsibility (and helps keep your house looking neat and tidy). Eliminating dirty dishes is an important part of keeping your house looking presentable day after day. Rather than letting dishes pile up on the counters, make a habit of loading the dishes straight into your dishwasher. If the dishwasher is full at the end of every day, turn it on in the evening and unload it first thing in the morning, before breakfast (so you can load your breakfast dishes into it right away). Loading and unloading the dishwasher as soon as it’s ready will help keep your house in tip-top condition and doesn’t give dishes a chance to pile up on the counter throughout the day. Wash any dishes that cannot go into the dishwasher as soon as they are dirty. If you are making supper and have to wait for it to cook, rather than sitting down and waiting, start washing all the dinner prep dishes. This way after supper all you have left to wash are the plates, utensils, and a few serving dishes. If you have time to wipe your kitchen countertops as you go throughout your day, do that. If you don’t have time to wipe them throughout the day be sure that you give them a good, thorough wipe at the end of the day after supper is made and the dishes are all washed. This way you won’t be waking up the next day to crumby kitchen counters (because is your house truly clean if the counters are a mess?). If the stovetop is something you use on a daily basis, be sure to give it a good wipe down at the end of the night to wipe up any spills or food particles that have collected throughout the day. I like to give our stovetop a quick wipe after every use, mostly because I can’t stand to look at a dirty stovetop. If you make a habit to wipe your stovetop regularly, at least once a day, you’ll eliminate spills from really becoming stuck on and will be saving yourself a lot of scrubbing time in the future. It is also a good idea at the end of every day to give your kitchen sinks a good wipe down with warm, soapy water. The kitchen sink tends to collect all kinds of food throughout the day, so giving it a well-deserved cleaning is a good idea. At the end of the day quickly zip through the bathrooms in your house with a microfiber cleaning cloth and some of your everyday household cleaner to give the bathroom sinks and countertops a wipe (you’ll also need these to use with your Thieves cleaner). Bathroom sinks and counters collect all kinds of dirt, hair, and stains from dirty hands throughout the day. Taking a bit of time each evening to quickly wipe the bathroom sinks in your house down shouldn’t take more than a minute each. Sweeping the kitchen floor is a task that should be done at the end of every day, not the start. As tempting as it may be to put sweeping off in the evening and tell yourself that you’ll get it done in the morning, realistically, when morning comes around, you’re often busy and don’t have time to sweep the floor. Doing a quick 10 – 15 minute clean up at the end of every day is a smart way to know you will be starting the next day off with a clean house, not a house that you have to maneuver your way through the clutter to get anywhere (or a house that you don’t know where anything is). You can include your whole family in this process and make it a nightly routine – just before bedtime have all the kids help out and spend 10 – 15 minutes cleaning up an area of the house by picking up their toys and putting them all away. Taking out the trash, at least the diaper trash and kitchen trash, at the end of every day will ensure anything that has been thrown in there throughout the day won’t stink up your house overnight. Now that you’ve gone through your daily cleaning schedule, you can grab the printable daily and weekly cleaning schedule here. Keep reading to see the weekly cleaning schedule I use to stay on track with my cleaning. Bear in mind that every family will go through a different amount of laundry. 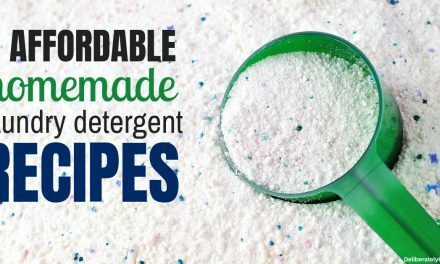 Families with small kids and cloth diapering families are a lot more likely to need to do a load of laundry every day, while families with older kids will have to do much less. I have included three laundry days on this list, but adjust those according to your family’s needs. The wonderful thing about laundry is that you can throw a load in then go complete your other daily tasks while you wait for it to wash and dry. Without further ado, let’s jump into the weekly cleaning schedule below. Monday’s are for washing all the laundry that has accumulated over the weekend and for wiping down your kitchen appliances until they shine. First thing in the morning (after making your bed and completing any morning tasks), throw in a load of laundry, then set off to wipe down your kitchen appliances. 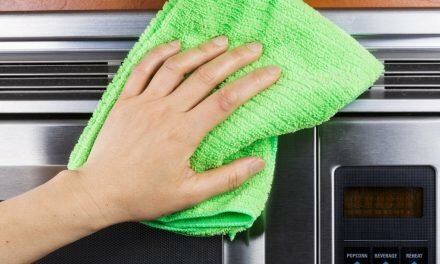 When I say wipe down kitchen appliances, I am talking about the microwave, dishwasher, fridge/freezer, toaster, oven, KitchenAid, and any other appliances you have in your kitchen. Wipe down the exterior of your microwave, then go here to learn how to clean the inside of your microwave without any scrubbing (even with stuff stuck on). Wipe down the exterior of your dishwasher, the exterior (paying special attention to the handles) of your fridge and freezer, wipe down your toaster, emptying the crumb tray, and wipe down the exterior of the oven. If you have stainless steel appliances in your kitchen, learn how to make them shiny, remove fingerprints and prevent scuff marks here. Stainless steel appliances can be a real pain to keep clean, especially when you have little people with dirty hands running around your house leaving a trail of dirty fingerprints wherever they go. I use this oil to keep our stainless steel appliances shiny and fingerprint-free. All you have to do is place the oil on a cloth (preferably these microfiber cloths so you don’t leave streaks) and rub it into the stainless steel. For Tuesday I have just one chore on the agenda. Granted, this chore can take a decent amount of time to complete, especially if you have lots of knick-knacks that have to be dusted around and under. Go through every room in your house and, working from top to bottom (to prevent any already-cleaned areas from getting dust pushed onto them), dust the surfaces in the room. Don’t forget about your ceiling fan, door knobs and light switches as these should all be wiped down, too. These are my favorite dusting cloths (in fact they’re the only ones I use) as they are lint-free and non-abrasive, therefore they don’t leave behind any residues that collect dust, and leave your surfaces free of dust for a longer period of time than if you were to dust with a different cloth. First, start by removing bath towels, hand towels, face towels, and floor towels from the bathroom. Place them, along with all your kitchen towels and linens, into the washing machine and turn on. Replace all the bath towels, hand towels, face towels, floor towels, and kitchen towels with clean ones. Place all items from in the shower and on the countertops on the floor. Dust the light fixtures and top of the mirror with an extendable duster. Put toilet bowl cleaner into the toilet. Spray bathroom cleaner onto the countertop, mirror, sink, toilet, shower, and bathtub. Starting with the mirror, use a cloth to wipe your mirror then, using a cloth that doesn’t leave streaks, wipe your mirror to rid it of any streaks. Clean the countertop, faucet, and sink. Wipe fronts of the cabinet to get rid of any streaks. Clean the shower and bathtub, starting at the very top (learn how to get rid of build up on your shower head and make it shine here) and working your way down, being sure to wipe every area of the walls and shelves. Once you get down into the tub part, if the tub has a lot of buildup on it, use a scrub brush like this one to remove the build-up and make your tub white again. Clean the toilet, starting on the top, working your way down the sides of the toilet tank and around the exterior of the toilet bowl. Wipe the lid, and the toilet seat, then go down to the floor and wipe the base of the toilet (this is where hair, dirt, dust, and dribbles tend to collect). Come back up and wipe the underside of the toilet seat and around the rim of the toilet bowl. Grab your toilet brush and scrub the inside of the toilet, working the toilet brush in and out of the trap several times to lower the water level in the toilet so you don’t have to worry about splashing water while you scrub. Before replacing your toilet bowl brush in its holder, rinse the brush and holder off under hot water in the bathtub. Replace everything you took off the countertops and out of the shower to their original spots, wiping them with a clean cloth as you put them back into place. Switch laundry into the dryer and fold it when it’s done. Cleaning bathrooms really is as simple as starting with the cleaner objects and ending with the dirtiest objects. For example, you want to start with the mirror and countertops, then move to the shower and bathtub, and end with the toilet. Thursday is floor day around here, and I find it best to get all the floors vacuumed and mopped in one day, rather than vacuuming and mopping a few days later as the floors will have a chance to collect more dirt by then and you will just be spreading it around with your mop. 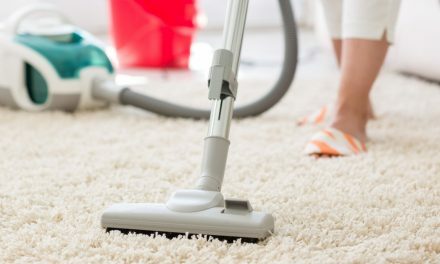 Since you have been sweeping your kitchen floors every day, that will significantly help reduce the amount of dirt and crumbs that travel around your house, so vacuuming shouldn’t take you too much time at all, but it’s important that you vacuum every room, hallway, and staircase in your house. After you have finished vacuuming, you can then grab your mop (I suggest this mop for best results and ease of use) and mop all the floors in your house that are mop-friendly. Today’s workload is a bit heavier, but it is important to get the vacuuming and mopping in your house done all in the same day. Some people choose to only clean the floor in certain rooms of their house one day, then the rest of the floors the next day. I prefer to clean all the floors in our house in one day because if you clean certain floors but not all of them, you will just be dragging dirt and crumbs from the floors that haven’t been cleaned yet onto the floors that are newly cleaned. Finally, Friday is here! If you were starting to worry by now, thinking you wouldn’t be changing your bedding at all throughout the week, today is the day. I like to get our bedding off the beds first thing in the morning, this way I am not making the beds, then taking them apart to change the bedding and making them again (I’m all about simplicity). First thing Friday morning, hop out of bed and strip it of all its bedding, then put a new pair of sheets and pillowcases on the bed and make your bed. Complete this with all the beds in your house, then throw all the bedding together in the washing machine. Once that load is done and switched into the dryer, you can then wash any other laundry that needs washing. It’s important to switch your laundry as soon as you can, and as soon as it’s done in the dryer to fold it and not leave it sitting in there. If you leave your laundry in the dryer (or do multiple loads and leave the clean stuff piled in a laundry hamper) you will quickly end up with mounds upon mounds of laundry that all needs to be folded and put away, and it will take you hours. I don’t know about you, but spending hours just folding laundry does not sound like my kind of fun, especially when it could have easily been avoided by folding it as soon as it is done. Getting in the habit of doing your laundry all the way to completion will free up a tremendous amount of your time. Saturday and Sunday are your days to rest from cleaning. Put cleaning off your mind and enjoy the weekend with your family, though you should still complete at least a few of the everyday cleaning tasks like making beds, doing the dishes, and taking out the trash. Even if that’s all you do for these two days, it will help you a lot when Monday rolls around. Now that you’ve read through all the steps for cleaning, are you ready to grab your free weekly cleaning schedule printable to keep in your house? You can grab your printable weekly cleaning schedule here. Once you print it off, it’s a great idea to place it in a plastic cover so you can use a dry-erase marker to check the items off as you complete them throughout the week, and when the week comes to an end you can simply wipe the marker off and start again. What do you like to do every week to keep a clean house? Are you a schedule junkie, or do you tend to stay as far away from schedules as you can? Do you have a different weekly cleaning schedule that works great for you? I’d love to hear from you!